Every year when my blog's birthday rolls around, I tend to get a little pensive when I talk about its beginnings. A reflection of things I learned along the way, how this blog saved me from a job I hated, blah de blah. And while all that is (still) true, this year, I mostly wanted to celebrate just one thing: the blogger community. Because one of the main reasons I keep blogging and baking is because I love being a part of the blogging community. Bloggers tend to be some of the sweetest and the best people. I'm talking about the kind of folks who, when I post pictures of my trip to Singapore, invite me to a homemade peranakan feast despite never even having met me in real life! Or the kind of person who, when I write that I'm having trouble locating a specific kind of fruit in a new city, offer to take me on a train ride across the bay and help guide me through her favorite supermarket! I could go on and on about incredibly kind and generous moments like that, but you get the gist. I don't know what it was about this year, but it was definitely the year in which all the online friends I met through my blog became "real" people. I mean, of course everybody was real before, but because we really only knew each other through social media and commenting on each other's posts, there definitely felt like a divide between "real friends" and "online friends". But then there was the Saveur Blog Awards ceremony, which, let's be honest, was pretty much a lovefest for all us bloggers. And after that, there came a stream of real life meetings, reunions, and new memories. In London, there was dinner with Kathryn and brunch with Izy. In Amsterdam, there was a baking session complete with a photo shoot and a hilarious broken bicycle incident with Renee. In New York, there was sneaking out of work to feast on hipster pizza with Cynthia as we traded notes on how we balanced blogging with our full time jobs. And let's not forget the hours of long giggly text message conversations with Alana, Betty, Cindy, and Nik (who is quickly becoming one of my closest friends in San Francisco). And just like that, all the folks who had been leaving comments on my blog for so long became real-REAL. We weren't just online friends anymore; we were actual friends. Which brings me to now. Four years ago, it never would have occurred to me that I would develop deeper connections with the folks I met through my blog than with the folks I know in real life. Maybe it's a sign of my age, but for me, there's always been a weird stigma about meeting friends online. It sounds a little desperate or something, like I've been sitting in a dark room for the last four years trolling Reddit. But maybe that's just in my head, because honestly, who cares? A lot of my blogger friends have been there for me, supporting and encouraging me through the good times and the bad ones, when friends from college, high school, and other real life people didn't. And there's something to be said about that. I'm incredibly proud and grateful to be a part of this wonderful community. 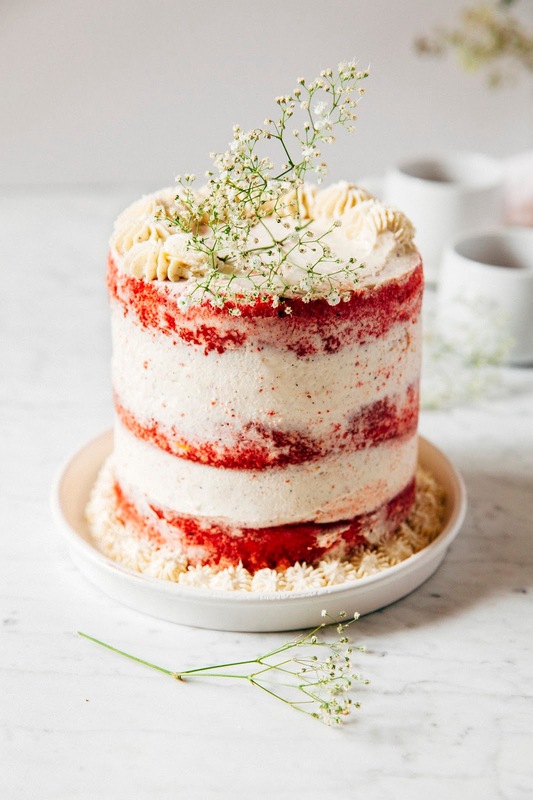 With all that said and done, let's celebrate everything and everyone with this glorious (and oh-so-naked) red velvet cake. 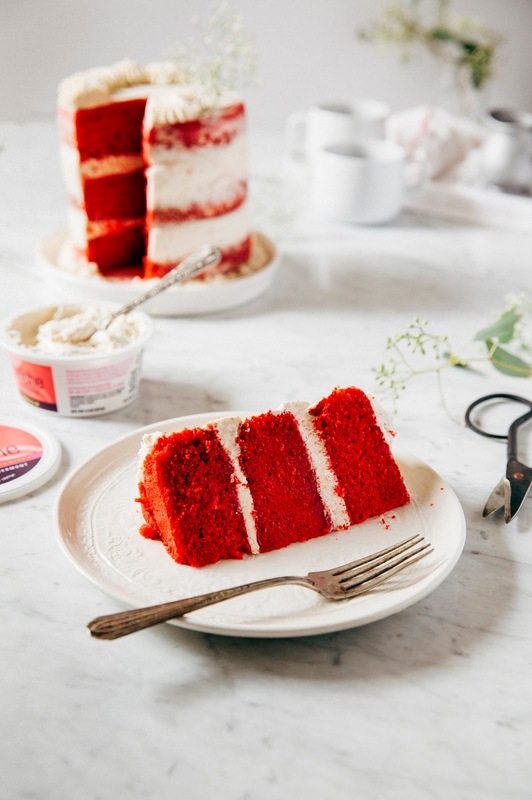 If you've been following my blog for sometime, you'll know that I've been working to perfect a red velvet cake recipe (based on this delicious cake I had one time in New York). I think I've finally mastered it! 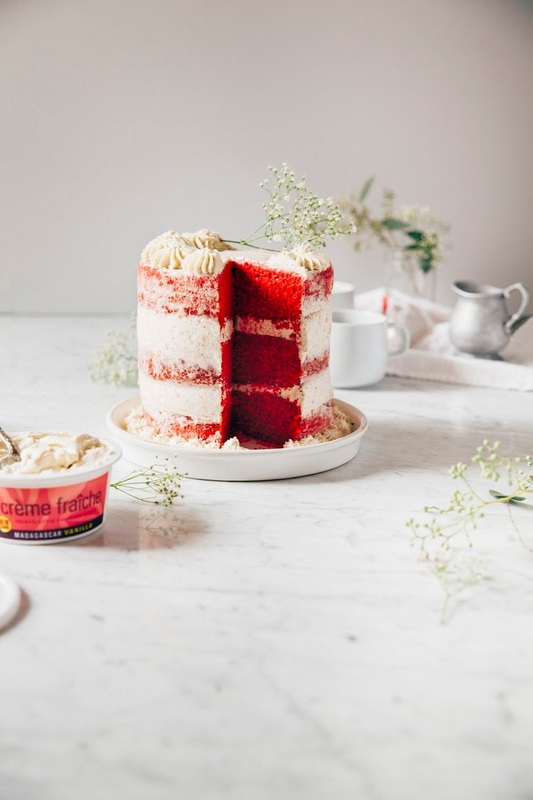 The red velvet cake is gloriously moist, with an open, airy crumb and strong hints of buttermilk, chocolate, and orange. 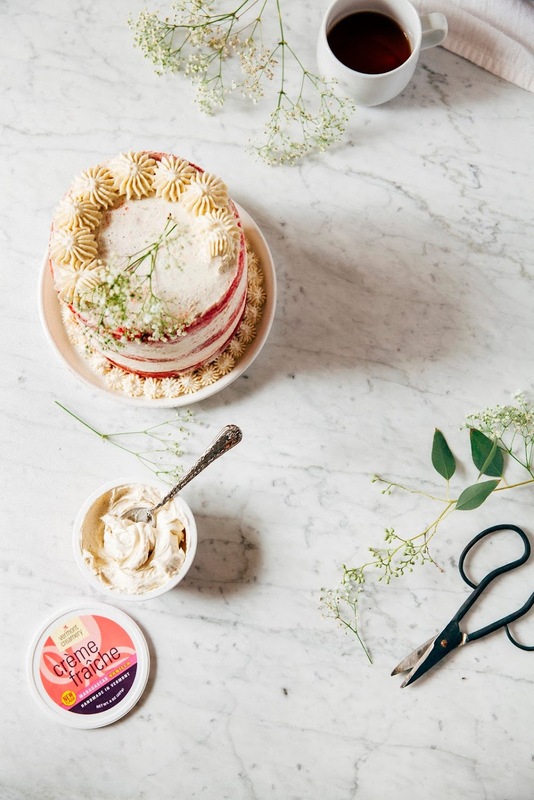 Since I'm currently obsessed with the naked cake look, I've lightly frosted it with a crème fraîche (a thick, cultured cream similar to sour cream but with a milder tang) frosting made with a beautifully Madgascar vanilla bean flecked crème fraîche from Vermont Creamery. It's creamy, tangy, and delicious, rounding out the cake's sweetness perfectly. Here's to another four years, guys! Thank you to Vermont Creamery for sponsoring this post by providing the compensation and ingredients to make it happen. Another one of the perks from blogging is, in addition to meeting all these cool people, I get to work with companies that I support and believe in. Vermont Creamery is one such example; they're a small dairy out in Vermont making the best goat cheese, butter, and one of my favorite baking ingredients of all time, crème fraîche. I'm working with them all month to provide crème fraîche dessert recipes (including a giveaway! ), so keep your eyes peeled and keep it fraîche. As always, all thoughts and opinions are my own. Thanks for supporting Hummingbird High and all my sponsors! 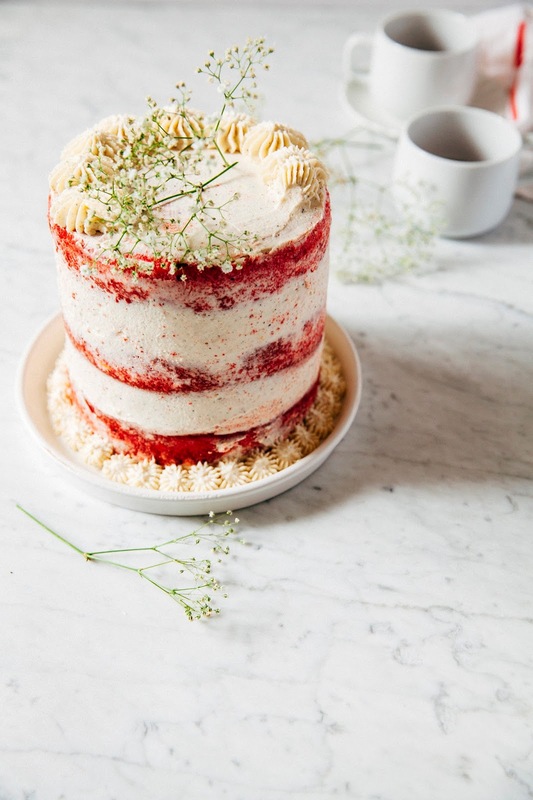 It can be quite difficult to frost this cake because its crumb is so open, light, and airy. 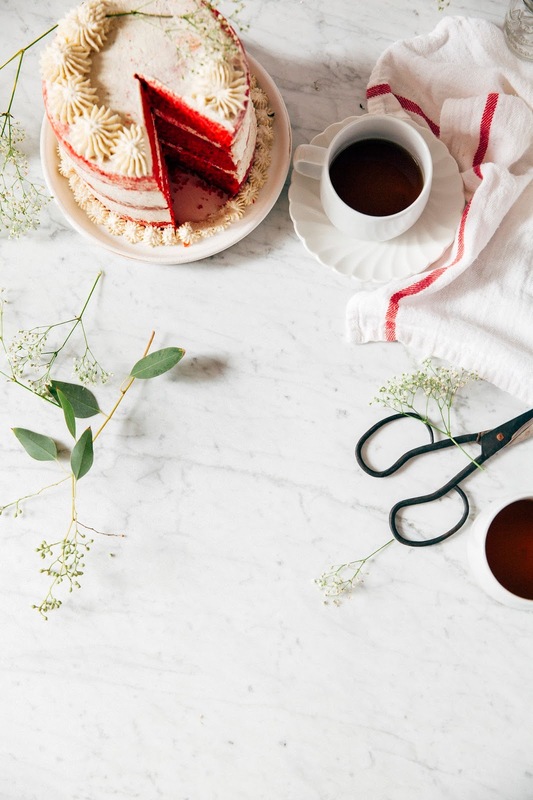 I recommend making the cake the day before serving, wrapping each layer in plastic wrap, and refrigerating overnight to chill all the layers. Chilling the layers will help the crumbs stay together and not beak away from the cake when you frost it. If opting for a fully frosted cake, I definitely, definitely recommend covering the cake with a crumb layer first before frosting. Also, make sure to double the frosting ingredient quantities if going for the full look. Vermont Creamery vanilla crème fraîche is available at some Whole Foods Markets; however, their regular crème fraîche is available in ALL Whole Foods Markets and more widely available in other major supermarkets like Safeway, Kroger, and Wegman's. If you can't find the vanilla version, I recommend buying their regular crème fraîche and spiking it with a tablespoon of pure vanilla extract or a teaspoon or two of ground vanilla bean powder, as well as a teaspoon or two of granulated sugar as it's slightly sweetened. Center a rack in the oven and preheat to 350 (F). 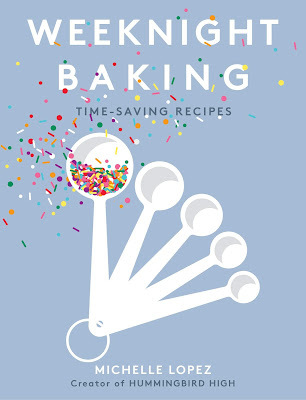 Prepare three 8-inch round cake pans by spraying generously with cooking spray, and lining the bottom of each tin with a parchment paper circle. Spray the parchment circle as well. In a small bowl, combine 2 cups granulated sugar and the fresh zest from 1 medium orange. Use you fingers to rub the orange zest into the sugar until it is fully distributed throughout the sugar and the mixture becomes fragrant — this will help release oils from the orange peel that will make your cake more flavorful. Set aside. In a medium bowl, whisk together 3 cups cake flour, 1 tablespoon natural unsweetened cocoa powder, 1 teaspoon baking powder, and 1 teaspoon kosher salt until well combined. Set aside. In the bowl of a freestanding electric mixer fitted with a paddle attachment, combine 1/2 cup unsalted butter and the sugar from the 2nd step and beat on medium speed until light and fluffy, about 2 minutes. 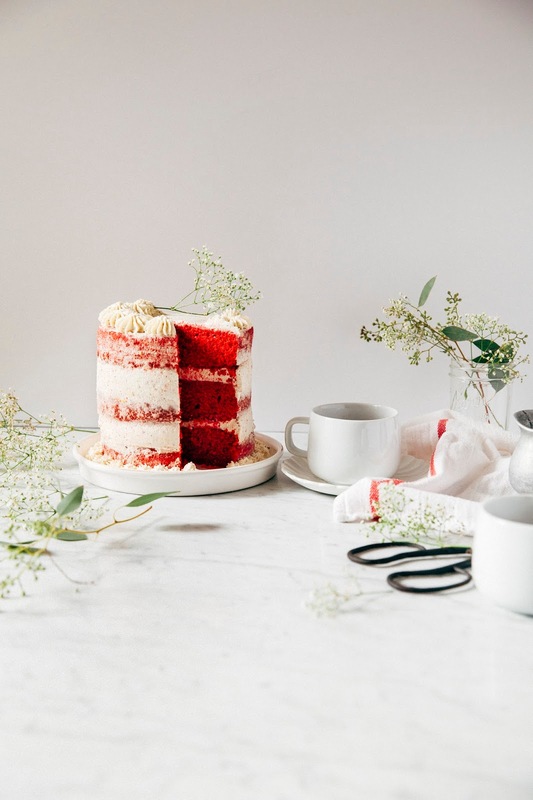 While the butter and sugar are creaming, combine 1/2 cup vegetable oil, 2 tablespoons red food coloring, and 1 tablespoon pure vanilla extract in a liquid measuring cup, using a fork or small whisk to briefly whisk together the ingredients. Lower the mixer speed to its slowest setting and stream into the oil mixture into the butter and sugar, making sure to stream the mixture down the sides of the bowl to avoid making a mess. Once the oil has been added, turn the mixer speed up to medium and continue beating for another 5 minutes, until the mixture is very light and fluffy and a vibrant pinkish color. Once the mixture is light and fluffy, reduce the mixer speed back down to its lowest setting. Add 3 large eggs, one at a time, only adding the next egg when the previous one has fully incorporated. Be sure to use a rubber spatula to scrape down the sides of the bowl after each addition. Once the eggs have been added, add the flour mixture from the 3rd step in three parts, alternating with 1 1/2 cups buttermilk in two parts, starting and ending with both the flour mixture. Continue mixing until the last of the flour is just incorporated — at this point, it's okay to have one or two flour streaks left in the batter. In a small ramekin, combine 2 teaspoons distilled white vinegar with 1 teaspoon vinegar. The mixture will begin to bubble and fizz immediately. Quickly add it to the cake batter and mix for an additional minute or so. 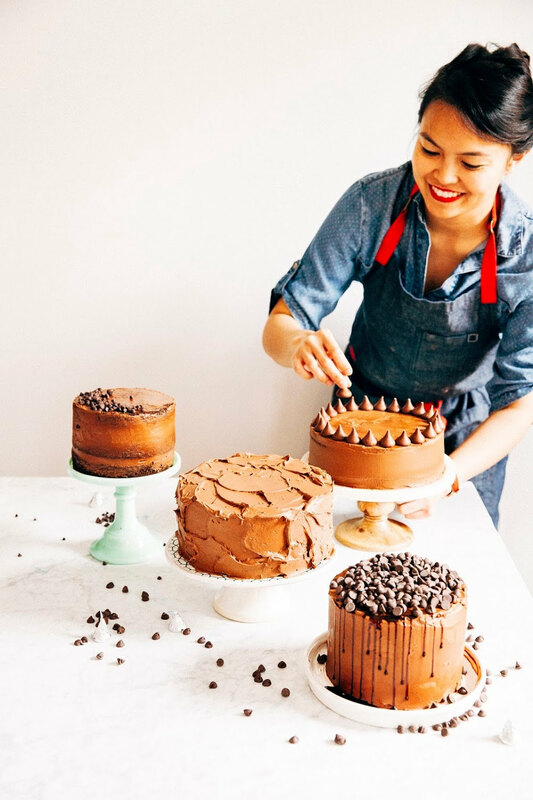 Divide the batter evenly among the prepared pans, and bake in the preheated oven for 30 to 35 minutes, or until a wooden skewer inserted in the center of each cake comes out clean and the tops of each cake bounce back when gently poked. Allow the cakes to cool in their pans on a wire rack for about 20 minutes, before turning out of the pans to cool completely. In the bowl of a freestanding electric mixer fitted with a whisk attachment, combine 4 cups Vermont Creamery vanilla crème fraîche, 3/4 cup confectioner's sugar, and 1/8 teaspoon orange extract, and fresh zest from 1 medium orange. Whip on medium speed until thick and creamy, about 3 minutes. Interested in past Hummingbird High birthday posts? The first birthday was celebrated with confetti cookies from Momofuku Milk Bar; the second with pink champagne cupcakes from Seattle's Trophy Cupcakes; the third with Molly Yeh's funfetti cake with my favorite chocolate cream cheese frosting. Happy Birthday Hummingbird High!